On July 27th, 2002 a fifteen year old child was wounded and taken prisoner by American forces in the village of Ayub Kheyl, Afghanistan. During the firefight that preceded his capture, Khadr was shot twice in the back causing gaping wounds in his chest that would still require treatment 10 months later. For the next few months he was held at Bargram Airbase, the site where much of the known harsh interrogation, or torture took place. 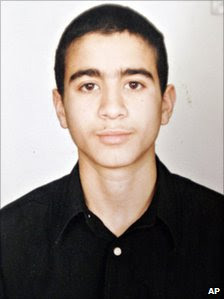 It was there that the worst torture the 15, then 16 year old Khadr faced in detention was carried out. But it didn't end there. In October of 2002 Khadr was transferred from Bagram to Gitmo where he has languished for 8 long years. He is now the last detainee at Gitmo with a Western passport, and the only detainee captured on the battlefield to be tried for murder. The mere fact that Canada is the last country to remove its citizens from the torture and abuse prone facility that is Gitmo is shameful enough, but that this detainee was a child soldier at the time of his alleged offense makes this a truly unforgivable dereliction of Canada's duty, and responsibility to its citizens. It is generally understood in the international community that child soldiers, even if they commit heinous acts, are themselves victims and should not be prosecuted as though they are adults. In a decent society, the reason for punishing people who have committed offenses is that they had a choice and they chose to violate the law. But what choice did a teenage Omar Khadr have? His father took him to Afghanistan as a child. Once there, what were his options? He had none. No...there is no justification for his treatment first by his father by bringing him into the world of Islamic extremism, then by his American captors for torturing him and denying him proper treatment as a child soldier, and finally by the Canadian government who could have requested he be repatriated as every other Western nation has done for their citizens in American detention. After 8 long years in detention, Omar Khadr may well be a hardened Muslim extremist today, but if he is, then he is one of America's making. When he was first apprehended, at the age of 15, he was a child thrust onto a battlefield not of his making and should have been rehabilitated, not tortured.